1 of 3 Heat oven to 375 degrees . Combine flour, 1/2 cup granulated sugar, brown sugar, baking soda, salt, shortening, peanut butter, milk, vanilla and egg. Beat at low speed until dough is stiff. 2 of 3 Shape dough into 1-inch balls; roll in sugar. Place 2 inches apart on ungreased baking sheets. 3 of 3 Bake at 375 degrees for 10 to 12 minutes or until golden brown. 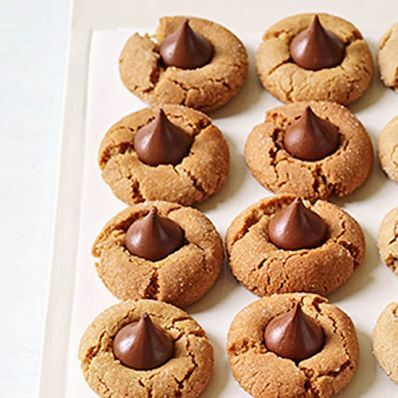 Immediately top each cookie with a Kiss, pressing down firmly so that cookie cracks around edges. Remove from baking sheets to racks to cool. Per Serving: 47 mg sodium, 1 g pro., 5 mg chol., 4 g Fat, total, 80 kcal cal., 2 g sat. fat, 0 g fiber, 9 g carb.